UCSC Theater Arts professor Mark Franko will moderate a roundtable discussion titled "Rights to Move: Choreographing the Human Rights Struggle," at The New York Public Library for the Performing Arts at Lincoln Center on October 10. The panel will discuss the role of dance in human rights struggles as seen through the work of such renowned dance artists as William Forsythe and Bill T. Jones. The event is part of a comprehensive series of free public programs produced each year by The New York Public Library for the Performing Arts in its Bruno Walter Auditorium. Participants will include Leah Cox (dancer, Bill T. Jones/Arnie Zane Dance Company), Thomas Keenan (Director of the Human Rights Project, Bard College), and Kendall Thomas (Director, Center for the Study of Law and Culture, Columbia University School of Law). "I think there's something about art with a live body that makes a very graphic statement of the value of human life," said Franko by phone from New York. "This should be a really freewheeling discussion." Thomas was the dramturg for "Human Writes," an installation by William Forsythe, and Cox has danced Jones's "Chapel/Chapter." Excerpts of both works will be screened at the event. 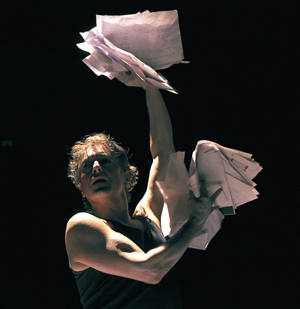 A professor of dance and performance studies at UCSC, Franko is also currently editor of Dance Research Journal--the international journal of dance studies published by the Congress on Research in Dance. Franko noted that he is now preparing for a spring UK speaking tour of graduate dance programs in Oxford, Manchester, Surrey, Roehampton and Montfort, as well as lectures at the University of Stockholm. He is also scheduled to collaborate with choreographer Cristina Caprioli to create a new work commissioned by the Venice Biennale. Franko added that he is additionally planning a reprise of his original dance/theater work "Pasolini"--a piece he performed in 2008 at the Berlin Academy of Arts-for the Dance and Text festival set for Vienna in 2010. On leave this fall, Franko returns to UCSC in winter quarter, where he will serve as director of the campus's Visual and Performance Studies Research Group.